There are few isotopes which have good reaction crossection for neutrons. B-10, an isotope of Boron has got a crossection of about 3840 barns for thermal neutrons and hence has got good importance in the field of radiation detectors. The abundance of B-10 is only about 19%. Elemental 10B in powder form can be used as sensitive medium directly by coating onto cathodes of detectors, but the limitation is that they have low sensitivity & poor pulse height characteristics. Hence the idea of using 10B in gas form has emerged. 10BF3 gas is widely used for radiation sensors for the purpose of neutron detection. The gas acts both as sensitive medium and ionizing medium. 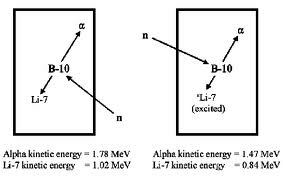 The products Li & He are ionized and hence possess charge and energy resulting in ionization by electrostatic interaction. The shape of 10BF3 filled counters is usually cylindrical in shape. The scheme of the detector will be as below. 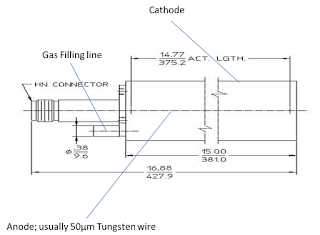 The outer shell acts as cathode and the tungsten wire at centre acts as anode. 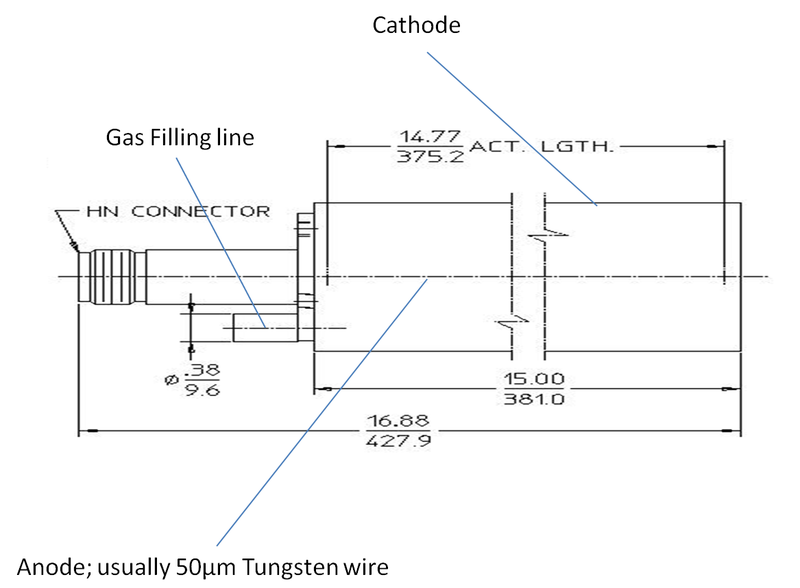 The 10BF3 gas filled detector is operated in proportional region of gas filled detectors. The anode is kept under influence of high potential such that enough electric field is created to create gas multiplication. “Gas multiplying means multiplying charge carriers created due to primary ionization of gas by incident radiation in the gas. The charge carriers i.e. electrons drift towards the anode at positive potential. The electrons gain momentum and get accelerated to high energies which can transfer to other atoms resulting in emission of further electrons called secondary electrons. The multiplication occurs more near the regions of anode wire as there is very high electric field intensity in the vicinity. The phenomenon of multiplication of charge in gas under influence of external high voltage is called as gas multiplication. 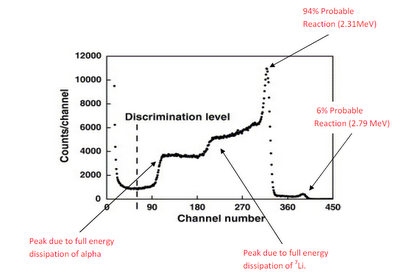 Gas multiplication depends on pressure, voltage and mass of charge carriers. The high voltage region in which this gas multiplication is linear and the collected charge is proportional to initial ionization i.e. number of original ion pairs created by incident radiation is called as proportional region. 10BF3 counters are operated in this region and are hence often called as 10BF3 gas filled proportional counters. The curve is derived by recording the variation of average counts observed in a preset time with high voltage applied to anode. A sample curve is shown below. i) Plateau length (Operating voltage range): This is the range of high voltage over which counter can be operated in proportional mode. The gas multiplication almost remains constant over this range of operation. The region is selected in such a way that the difference of count rate is minimum. In other words, slope shall be minimum. 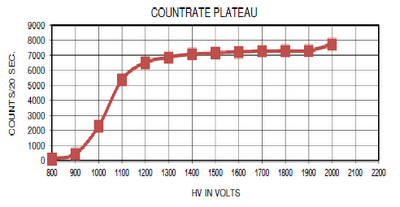 ii) Plateau slope: The slope in general for BF3 counters, shall be <3% per 100V. iii) Operating voltage: This is the voltage which is selected by the user based on the sensitivity required and stability of high voltage power supply. This shall be noted that the count rate at lower end of plateau region will be low as compared to count rate at high end of plateau. Hence deciding operating voltage will also decide sensitivity of detector. How does mass depend on speed?